The most popular photo stop at the Buffalo Bill Center of the West. Seth Menning photo, 08.27.15, Flickr, Creative Commons. When entering the Buffalo Bill Center of the West, it’s hard to miss the kind, welcoming voice of William F. “Buffalo Bill” Cody greeting visitors before they embark on a journey through the Buffalo Bill Museum. The life-size, misty Heliodisplay of Cody, played by Pete Simpson—Cody, Wyoming, native, United States Navy veteran, Screen Actors Guild (SAG) card holder, historian, professor, and actor—leaves audiences of all ages yearning to learn more about the captivating life of Buffalo Bill. The Heliodisplay’s smoky, mysterious form (created when a likeness is projected through water vapor) gives the appearance of a floating, holographic 3D figure. 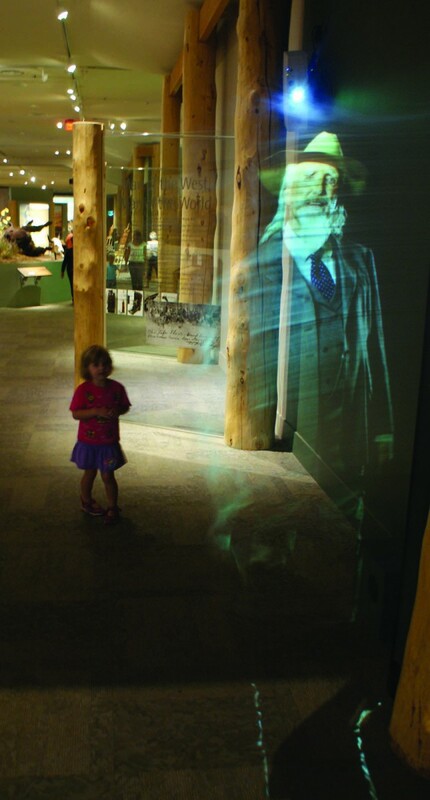 The image of Buffalo Bill can be manipulated by the touch of a hand or even by walking through the haze—a feature kids love. And by then, Simpson’s Buffalo Bill persona has fully captured the crowd’s interest, and they can’t wait to explore the incredible life of Buffalo Bill. 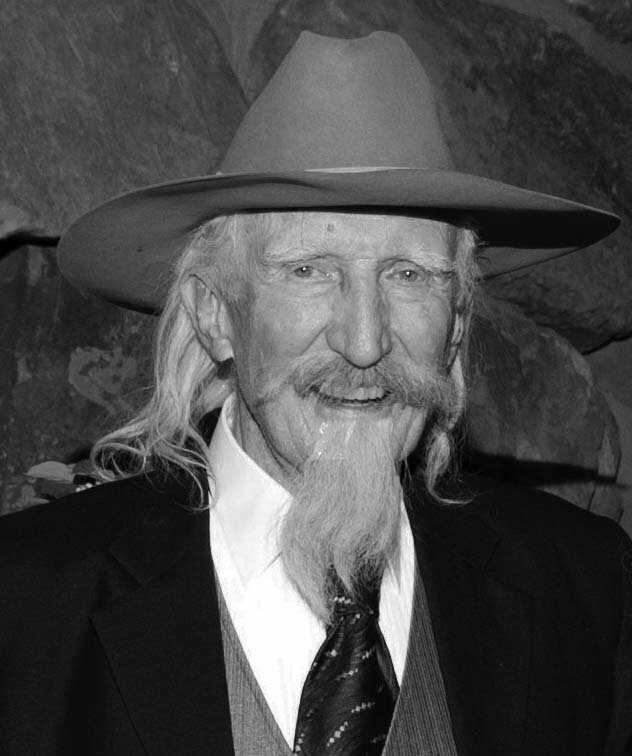 I was fortunate enough to sit down and have a conversation with Pete Simpson to learn about his journey as an actor, as well as his complex transformation into the role of Buffalo Bill for the Center of the West. Additionally, he discussed the many reasons he felt more connected to playing this role than others. Not only did I have the chance to learn about his unique experience taking on the role of William F. Cody, but also about the individuals who have inspired him along the way to continue his acting career. “I think I became interested when I was actually growing up—when I was just a kid,” Pete explained. 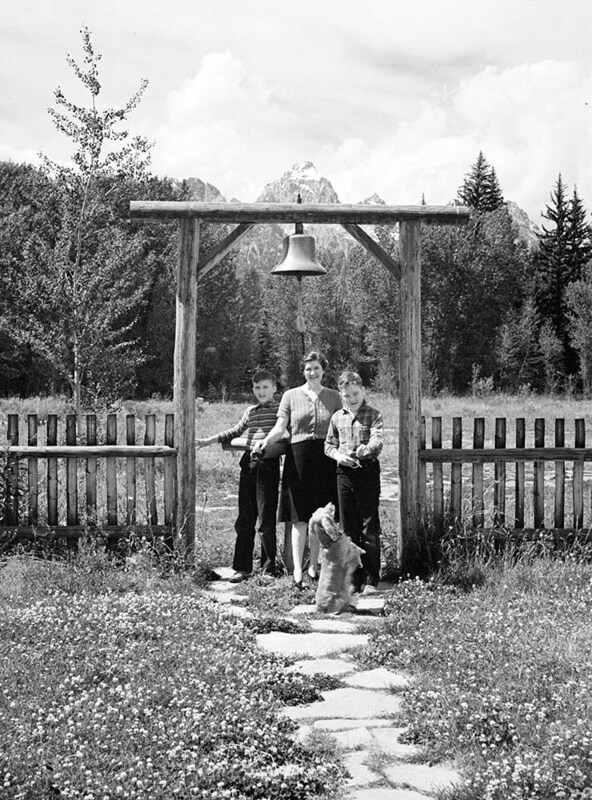 In fact, when he was only 8 or 9 years old, he would perform little magic shows at his house, presentations he called “magickans.” His brother—former United States Senator Alan Simpson, R-Wyo.—played his “stooge” in the magic shows. Pete shared that his brother was around 6 or 7 years old at the time and constantly asked why he was always being cast as the stooge in these productions. When Pete entered high school, he was still interested in acting and played various parts in many community productions. After high school, though, he was unable to continue acting while in college because he played basketball for the University of Wyoming, a full-time commitment. However, he explained that he later was convinced to try out for the play, The Rivals. He was cast as a man named Bob Acres, whom Pete described as a “country bumpkin” character. “I had great fun playing Bob Acres,” Pete said. He added that around 1953, television studios began contracting with movie studios to film college plays. Companies aired these plays on television during the slower summer season. He explained that, as a result, he landed a screen test for Paramount Studios, a widely known television production company and motion picture distributor. These experiences sparked Pete’s interest in acting, and he thoroughly enjoyed being involved in any kind of community theater production. At this point, Pete interjected that Wynona Thompson—for whom the auditorium in Cody is named—happened to be his teacher, as well as Al’s. As a member of the United States Navy for four and a half years, Pete was not involved in any kind of acting during that time; however, when he returned to Cody around 1960, tryouts were taking place for the play George Washington Slept Here. Pete auditioned and received a part in the production. At that same time, Lynne Livingston, a talented actress—and another former student of Wynona Thompson—was back in Cody on a vacation. She had been living in New York, making her way into show business. 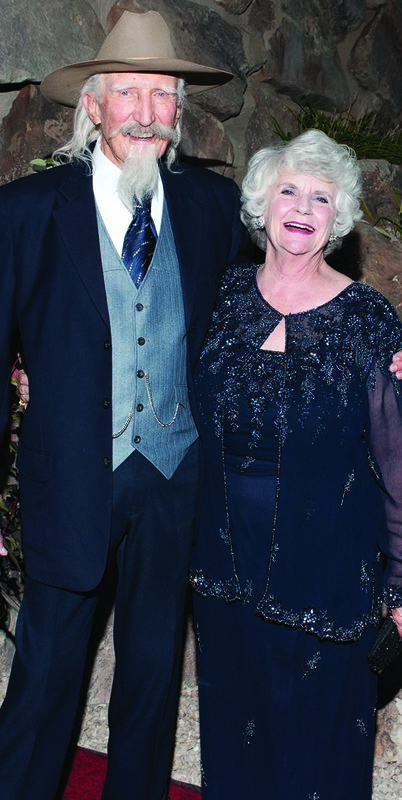 Pete, pictured here with wife Lynne, donned his Buffalo Bill personage to greet guests at the 2012 Patrons Ball. “She did a vast number of great things,” Pete said of Lynne. One of her many impressive achievements included placing well in the Miss New York City Contest. Soon after their marriage, the Simpsons moved to Eugene, Oregon, where Pete earned his PhD at the University of Oregon. During that time, Lynne joined the University’s acting program. As a result, Pete became even more involved, acting in various commercials that led him to his membership in the Screen Actors Guild. In fact, after Pete returned to Wyoming to work at Casper College, he took a part in a commercial for Exxon Oil Company. He described how the commercial featured a coalfield technology program similar to Casper College’s, and how Exxon wanted to have the opportunity to advertise it. “I played the part of some professor—a geology professor. I didn’t know beans about geology,” Pete laughed. The Simpsons have been married fifty-six years, and for forty-five of those years, they have had an independent, non-profit called Spontaneous Theater Productions. The organization possesses some of its own production equipment used for community theater plays. “When you pick the right play, it’s nice for you and your community,” Pete explained. He believes the best of theater is found in a small community like Cody. There, the audience generally knows that the actors and actresses in the production are not heavily paid; so it is clear the individuals are extremely dedicated. “You get added passion and commitment,” Pete adds. How did you become the Center of the West’s resident William F. Cody? Eventually, Pete did go to the Holiday Inn for the audition process. To his surprise, he quickly received a callback. Within a short period of time, the production company—Second Story—contacted him, and said they were all going to Portland, Oregon, to film. Pete spoke highly of the production company, saying they were wonderful to work with, and everyone was very kind throughout the filming process. He was also impressed with their great attention to detail, especially when it came to perfecting his makeup in order to fully replicate Buffalo Bill. To morph Pete into the character of Buffalo Bill, the company used real human hair to re-create his hair and beard. Pete noted that he originally tried to grow a beard for the production, but in the end, it wasn’t necessary, and he had to shave it. In addition, to most accurately replicate William F. Cody, former Buffalo Bill Museum Curator John Rumm accompanied Pete and the production company, bringing Buffalo Bill’s real hat and boots for Pete to wear during the filming. The production company even worked from a photo of William F. Cody in order to get the replication just right. Pete was in Portland for a total of two days, and the filming only took about four hours. To top off the experience, the evening after the filming took place, he said he had the chance to enjoy a fantastic dinner, complete with clams and champagne. “It was fascinating,” Pete continued. Additionally, Center staffers provided paintings and photos from the Buffalo Bill Museum collection in order to depict a room at Buffalo Bill’s TE Ranch southwest of Cody. Pete observed that Second Story was able to completely re-create that room on the stage. How did being a Cody native influence your role as Buffalo Bill? Because Pete is a Cody, Wyoming, native, an obvious question is whether he was more connected to playing the role of Buffalo Bill than other actors might have been. Or did he feel the same about it as other roles he’d played in the past? Pete explained that his grandmother, Maggie Simpson, was one of the first members of the Buffalo Bill Memorial Association when the museum in Cody was first getting started. Additionally, she was one of the individuals who envisioned what a wonderful organization the museum would become. “I got away with murder that night,” Pete joked. And although that was fun, he said that playing this character for the Center of the West was a very different experience. Pete Simpson as Buffalo Bill. Was there anything that surprised you about the process of transforming into the character of Buffalo Bill? Overall, Pete was quite surprised with the level of care and detail the production com¬pany in Portland exercised and how capable they were. He added that the company was so extraordinary and skilled at the process of transforming him into Buffalo Bill. He was also surprised they did not use the traditional wigs one might wear for a typical production. Nor did they use a “mustache that makes you look more like Santa Claus, rather than Buffalo Bill,” Pete joked. “It was a remarkable experience,” Pete continued. Because the makeup artist worked with actors and actresses from the television show Grimm, she was extremely skilled, he explained. “And Grimm—I saw one episode. Talk about makeup. It’s weird, wonderful stuff,” he concluded. Is there anything else you would like to add about you and Buffalo Bill? Pete is quite pleased that the Heliodisplay brings such a positive reaction from audiences of all ages, and he is proud to have played the part of Buffalo Bill for the Center of the West. He feels it is a “wow” factor within the museum. “Kids love it—they walk through it. They take pictures with it,” he observed. Pete also noted, “I am most pleased at the chance to [play the role of Buffalo Bill] for this museum that carries a lot of our heart’s desires in this town—and certainly in the family—all the way back to Maggie Simpson. “I would hope that Maggie, my grandmother, would have been pleased and proud because she loved Buffalo Bill, and I hope I did him justice,” Pete concluded. 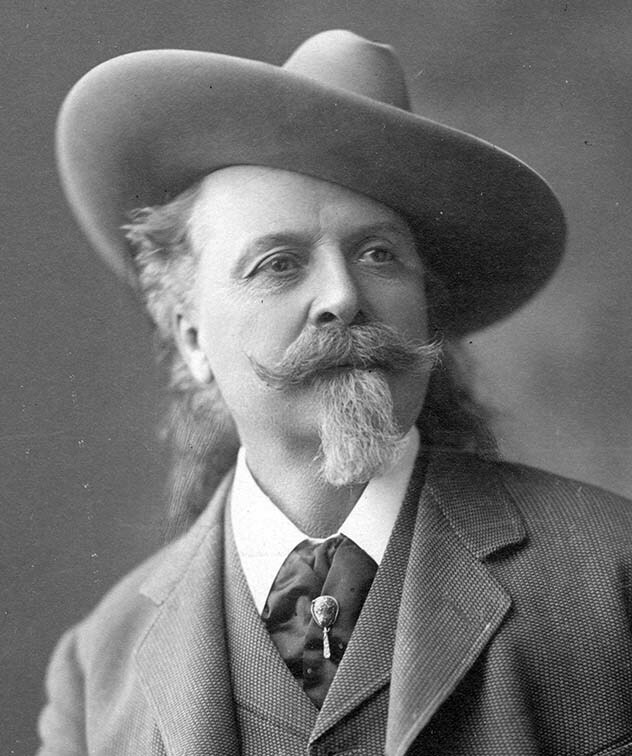 It goes without saying that not only did Simpson do Buffalo Bill justice, but he has also played an instrumental role in preserving the rich history of Cody’s namesake. The Heliodisplay is an element at the Center that fascinates all who come through the doors and inspires them to learn about a life of adventure on the frontier. With Simpson’s misty, captivating figure at the entrance of the Buffalo Bill Museum, William F. Cody’s life, legacy, and identity lives on to educate and engage all who enter. Michaela Jones, a Cody, Wyoming, native, was the Public Relations intern at the Center of the West for the summers of 2016 and 2017. She received her bachelor’s degree from the University of Wyoming where she majored in English and minored in professional writing and psychology. Jones now serves as Communications/Social Media Specialist for Northwest College in Powell, Wyoming.